up with. We’ve boiled it down to get you the essentials we think you can use to help you build your healthy kid. 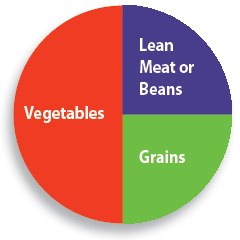 This is what a healthy meal looks like on a plate: 1⁄2 vegetables, 1⁄4 lean meat or beans and 1⁄4 grains. Figuring out serving sizes is a confusing issue. Portions of both food and drink have gotten larger year after year - to the point of absurdity sometimes - and waistlines have increased along with them. Children are growing up without a standard reference point to determine appropriate amounts because most of what is served to them is too large a portion. It is easy to think that a portion is the same thing as a serving, but the two are completely different. A serving size is a standardized way of measuring food based on nutritional need and can be very different from the portion size or amount of food served. The serving sizes you see on a Nutrition Facts Panel are based on portions commonly eaten and they are not necessarily a recommendation. The serving sizes on a label are standardized so that you can compare one product to another; a slice of bread from one brand to another. It is important to look at the label so that you know how many calories and other nutrients are in the package that you purchased, but don’t use it as a guide for how much to eat. The USDA’s Food Guide Pyramid has determined the amount of fruits, vegetables, grains, meat/beans, oil and milk that needs to be consumed every day. It lists common serving sizes, but does not go so far as to recommend the amount to be eaten at one sitting for children. Depending on the age of the child, the serving size will actually be smaller than what is listed until they reach a certain age. Below are some suggestions, but always use your child’s appetite as a guide for the amount they can handle at any one sitting. What is important is to make sure that they consume the total servings per day that is recommended. Children need 2-7 grain servings a day measured in ounce equivalents depending on their age, activity level and gender. Click here for your child’s daily requirement. It is best to consume at least half to most of grains as whole grains. The whole grain has not been stripped of its bran and germ layer, which contains fiber, many B vitamins and iron. The recommendation for fruit will be in cups, anywhere from 1 to 2 cups a day depending on your child’s age, activity level and gender. Check here to see how many cups your child needs per day. The typical serving size for a young child will be 1⁄4 - 1⁄2 cup at a sitting whereas the older child can eat 1⁄2 - 1 cup at a time depending upon the fruit. The total amount at any one sitting doesn’t matter as long as the total for the day is eaten. Children are more likely to eat the recommended amount of fruit for the day as compared to vegetables but most eat only apples, bananas or juice. Try and offer many different varieties in a lot of different colors. Breakfast time is a great time to offer fruit as it can be sprinkled on cereal, used on top of yogurt or waffles, or by itself in a glass of juice. Snack time, and dessert time following lunch or dinner, are other good times as well. Children age 1-6 year should limit juice consumption to 1⁄2 cup per day. For children age 7-18 this can increase to 1 cup per day but no more than 12 oz. In general, 1 cup from the fruit group equals 1 cup of fruit or 100% fruit juice, or 1⁄2 cup of dried fruit. What doesn’t count as a fruit serving? Products that say on the front of the box that they have fruit or vegetables in them but when you check the ingredient list, it is far down. If it is not #1 on the list, it doesn’t count. Click here to determine the total amount of vegetables your child needs per day put general requirement table. The recommendation will be 1 to 3 cups a day depending on the age, activity level and gender of your child. The typical serving size for a young child will be 1⁄4 cup at a sitting whereas the older child can eat 1⁄2 -1 cup at a time. You know your child’s appetite best and whether or not they can eat 1⁄2 cup at a serving. The total amount at any one sitting doesn’t matter as long as the total for the day is eaten. If you offer vegetables first to your child before the rest of the dinner, they will be more likely to eat it and not complain that they are too full after eating the rest of their dinner. Be sure to offer a variety of vegetables; orange, dark green leafy and legumes especially. In general, 1 cup of raw or cooked vegetables or vegetable juice, or 2 cups of raw leafy greens can be considered as 1 cup from the vegetable group. The serving sizes for meat and beans are in ounce equivalents. They will range from 2-6/1/2 ounce equivalents per day depending on the age, gender and activity of the child. Click here for general requirement table. For young children, 1 oz equivalent of meat or beans will be sufficient at a serving. The older child will be able to eat 2-3 oz at a sitting. In general, 1 ounce equivalent from the meat and beans group equals 1 ounce of meat, poultry or fish, 1⁄4 cup cooked dry beans, 1 egg, 1 tablespoon of peanut butter, or 1⁄2 ounce of nuts or seeds. It is essential that children get the recommended amount of calcium they need every day for strong teeth and bones. Many children, especially teenagers, do not get enough calcium and what they don’t realize is that you can’t make up for it later. The calcium you take in before about age 20 is used to build bones and after that it is all about bone maintenance, whereby you can only take calcium from the bones that you already have if you don’t have enough in your diet. Milk is a main source of calcium in the typical American diet. Most children need 2-3 cups per day. Click here for your child’s requirement for milk servings Xgeneral requirement table. The smaller child will drink or eat 1⁄2 cup at a time whereas the older child can consume 1 cup at a sitting. These foods count as 1 cup of milk: 1cup milk (low fat or fat free after age 2), 1cup yogurt (low fat or fat free after age 2) or 2 ounces (3 slices) of American cheese. Oil is important for health, especially in the growing child, as it provides essential fatty acids and vitamin E. Oils are the major source of monounsaturated fatty acids (MUFA’s) and polyunsaturated fatty acids (PUFA’s) in the diet. PUFA’s provide essential fatty acids necessary for adequate growth and development. Most individuals get enough oil in their diet, but it is not always from the best sources. Oils found in nuts, salad dressing, and fish are preferable to deep fried foods, butter and processed food with trans fat. The discretionary allowance for oils per day ranges from 3 tsp a day in the 3 year old to 7 tsp a day for the teenage male. Click here for the correct amount as it depends on age, gender and activity level put general requirement table. 1. Eating more than the recommendation from the essential food groups. 4. Foods and beverages that are mostly fat and sugar; soda and candy for example. The amount of extra calories allotted per day is very small, 130-300 calories, depending on the age, gender and activity level of the child. Click here for specific amounts. That doesn’t amount to very many cookies, chips, soda or sweetened cereal. The following is a list from the USDA. Look over the items. Some that you may not think of as discretionary are considered extra; a blueberry muffin, crackers and whole milk cheese for example. You can see how quickly the extra calories can be used up. 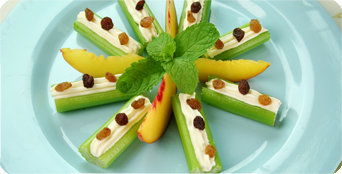 One soda or even fruit flavored yogurt can use up all discretionary calories for the day. Most children eat unhealthy food every day, especially at snack time. If your child is in this category, limit the amount of junk food (cookies, chips, ice cream and soda for example), to 75-100 calories per day for the younger child and teenage girl, and 200 calories per day for the male teenager. Be careful and look at the Nutrition Facts Panel for serving sizes and calories. This amount adds up fast. Teach children to eat their vegetables with meals by offering smaller portions of everything first; grains, meat and vegetables. Try and hold off giving them seconds of anything until they finish their vegetables. Once they do, they can have seconds of whatever they want. Don’t set up your young child to fail. Offer small enough portions so that they can finish it. This gives them a sense of accomplishment and sets the stage for eating healthful foods at mealtimes. Look at the Nutrition Facts Panel for serving sizes and calories for guidance to determine the serving size of a food that does not fit into any one specific food group: lasagna, ravioli, and soup, for example. If you let your child decide what he or she wants to eat, most will eat only the processed food or carbohydrate options. Teach him or her balance at each meal and snack. Don’t make mealtime a battlefield, but at the same time set up guidelines that must be followed, no dessert (fruit based on most nights) unless the meal was eaten. Remember that you are teaching them healthy habits for life. Portion out serving sizes of snacks into small containers or plastic bags and give these to your child instead of the entire bag of chips or whole box of cookies.